Happy Spring! I welcome this season more than any! Although, I have to do a few cartwheels over our mild Wisconsin weather this winter. The snow is already melted and temps have been gentle and I can feel spring working hard to blossom. Toss in a side of extra daily light and I feel like I have been winning the spring lottery! With the warmer temps, we jump at the opportunity to open a few windows and let fresh air take over our home. And with that, I find motivation to tackle some spring cleaning. And to get outside and play! 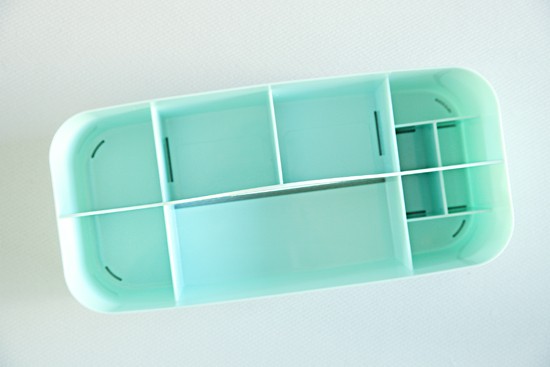 I have made some minor adjustments to our cleaning caddy and products over the years, and I haven't chatted about it in quite some time, so I thought today was the perfect day to pop in with an update. When it comes to caddies, however, I will say that as much as I love the tin utensil caddy, not all tin/metal caddies are created equal. I added one to our main bathroom for some cleaning items, and also another larger handled bin under our kitchen sink, and both have since broken. So although darling, be sure to consider that tin caddies are prone to rusting, are heavy, and may not be welded in a way that the handle can "handle" the weight of the contents. 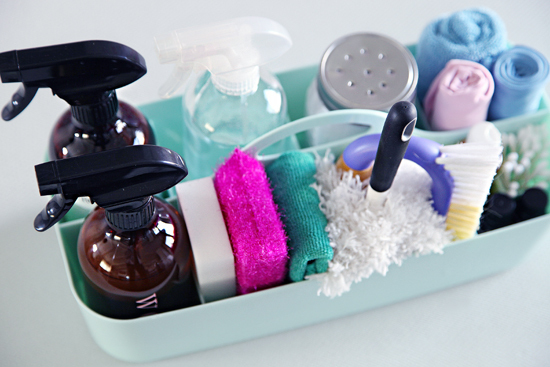 The overall goal of a cleaning caddy is to provide a one stop shop for all supplies needed to maintain each room in the home. 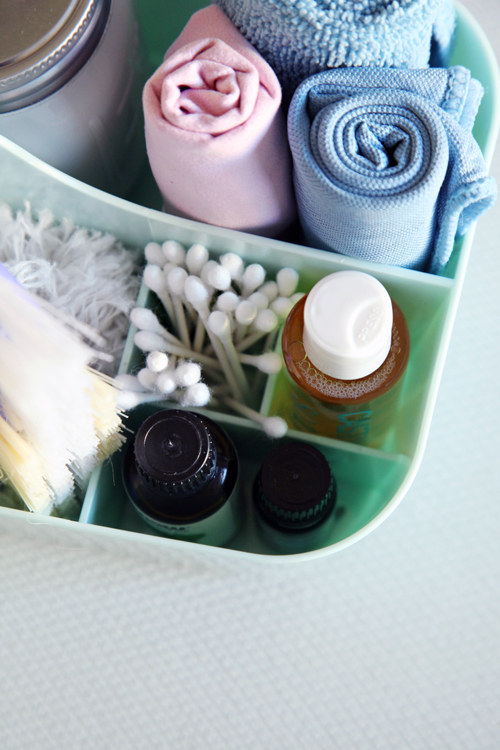 Aside from a few specific cleaning products that I store in each bathroom for daily clean-ups, this caddy is filled with all of my favorite supplies that I reach for during my weekly cleaning sessions. I have been making homemade cleaners and laundry soap for awhile now, and with that comes larger packages of soaps, water, vinegar, oils, etc... Those are all stored in our laundry room cleaning cabinet, where I can head back on occasion to whip up a new batch of cleaners. I also use the cabinet to store the mop and lower level broom and vacuum. 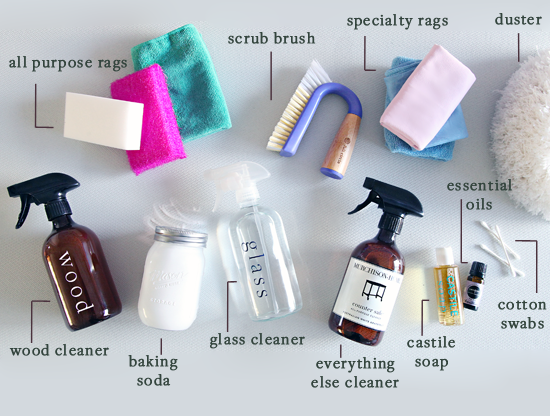 Since I have begun making my own cleaners, I have definitely simplified the process over the years. 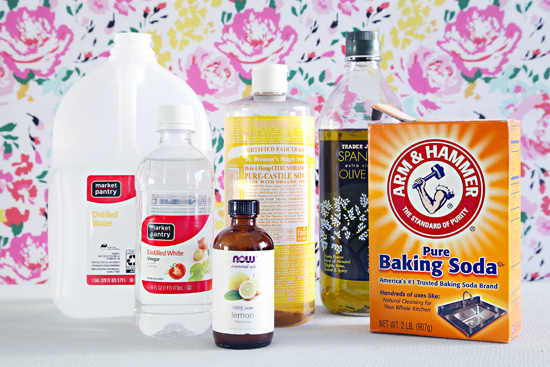 After reading mixed reviews, I stopped using vinegar as my main all-purpose cleaner. There have been mentions of it not being friendly with certain stone counters, tiles and floors, so I decided to stop risking it. I now purchase our all-purpose cleaner and toilet bowl cleaner, but the remainder of our solutions are still all made at home. I know that not everyone finds time or benefit in making your own cleaners, and I totally get it. The upside is that it can save money and you know exactly what you are cleaning your home with. The downside is the time it takes to make the solutions and the space needed for storing the bulk supplies. After a little hunting, I landed on this one from Amazon. I know it sounds very Danny Tanner like, but every once in awhile I need to rinse out the caddy due to spills, leaks, accumulated dust and dirt... and this caddy even boasted small slots on the bottom that allow it to be easily cleaned and dried. It fit every requirement on the checklist, the only flaw is that it could be a smidge deeper. My favorite part is actually the compartments. It keeps things from shifting around and allowed me to easily add a few smaller elements that I use frequently. Now, let's take a closer look at what I use to clean our home top-to-bottom. The only thing I can't fit inside of my caddy, is my mop (which has the cleaner built in - read more about that here). Everything else I really ever need is always right at my finger tips. 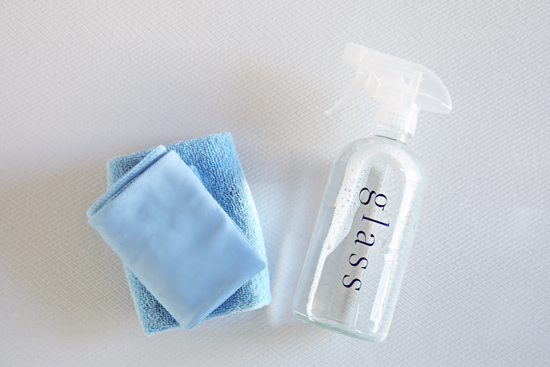 Recipe: Our glass cleaner is made up of distilled water, a dash of vinegar and a dash of essential oil. How I use: While cleaning glass surfaces, it really is all about the rags. I start by spraying the surface with the spray mixture and follow up with the soft microfiber rag. This does a good job at cleaning the surface and picking up smudges and dirt. I finish by wiping down the surface with the glass polishing rag, which leaves everything sparkling and streak free. The rags really do all of the work; I could get away with using only water but added a small amount of vinegar and essential oil because I also use this mixture for other tasks (mentioned below). What I clean: All of our glass surfaces, windows, mirrors, tables, etc... This solution also works wonderfully at polishing hardware and fixtures. Recipe: Our wood cleaner is made up of 2/3 distilled water, 1/3 olive oil, a dash of castile soap and a dash of essential oil. How I use: Shake well and then spray on wood surfaces. Follow with a micro-suede polishing cloth. The oils keep the wood from drying out, while the castile soap actually cleans the surface. The soft cloth prevents any scratches while cleaning. What I clean: All of our wood surfaces; accent furniture, dining table (on occasion), handrail and stairs. 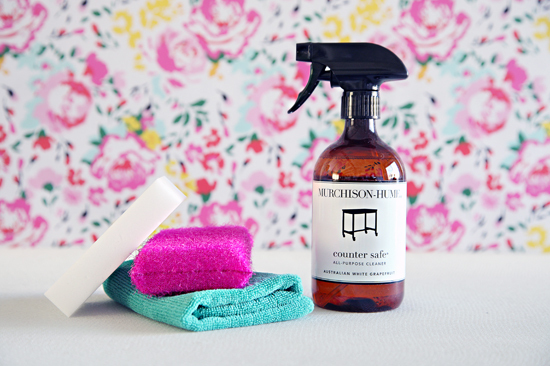 Recipe: Head to Amazon or to the store to pick up an awesome, friendly, good smelling cleaner. I have tried a variety of options, everything from Mrs. Meyers to Method and Honest Co., and right now my favorite is the Murchison-Hume Counter Safe in Australian White Grapefruit. It smells so fresh and leaves the fewest streaks on our counters. It also comes in a larger refill friendly bottle. How I use: Spray and clean with either a microfiber rag, a sponge or a magic eraser. What I clean: I use this on every other surface beyond glass and wood. I use it on our trim and doors, face plates, doorknobs, cabinets, counters and even to touch up small spills on the floor. 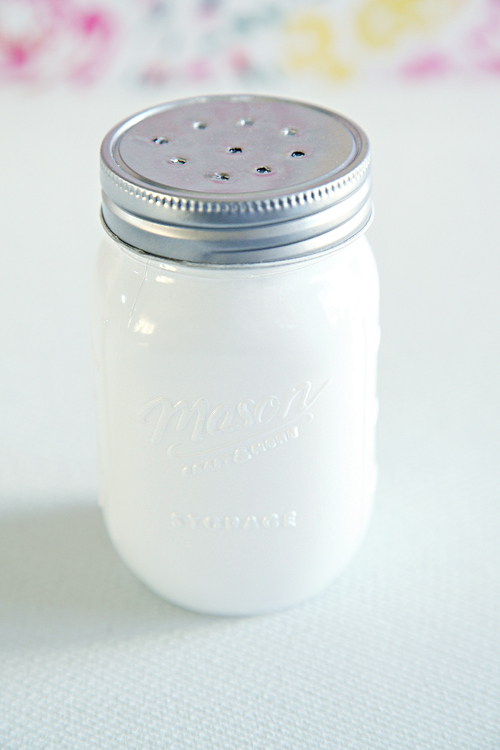 Recipe: Fill jar with baking soda, puncture the lid to add a some holes, add a few drops of essential oil and shake. How I use: Sprinkle on surface and follow up vacuum or spray of choice depending on the task. What I clean: Baking soda is a natural deodorizer, and it also makes a really great scouring powder. I generally sprinkle it in the sink and then spray the water/vinegar combo and scrub with a sponge. This leaves the sink shiny and smelling great. I also sprinkle it on our mattresses, rugs and furniture on occasion prior to vacuuming. While cleaning tougher areas, I sprinkle a small amount on the surface and pair it with an all-purpose cleaner and a sponge. 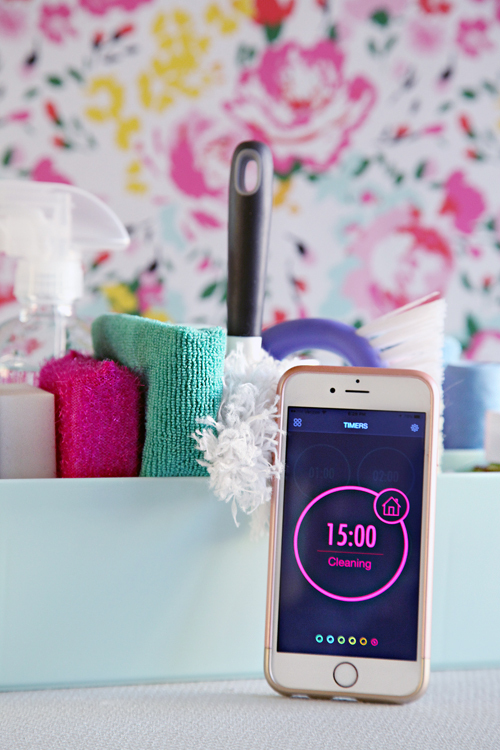 Duster: For quick dusting tasks around the house - bookcases, electronics, blinds, ceiling fixtures and fans. Cotton Swabs: When paired with an all-purpose spray, I use these swabs for cleaning window and trim crevices as well as other smaller, hard-to-reach places (computer keyboards, car vents, etc...). Castile Soap: This soap is ultra concentrated, and a little bit goes a very long way. I like to add it to the sink or to a spray bottle with water for really tough jobs. I keep the large bottle in our laundry room, but a travel toiletry bottle is the perfect size to keep some upstairs also. Essential Oils: Some of them actually have beneficial cleaning powers, but I also love the scent they add to our home while cleaning. I add them to most of our cleaners, our humidifiers and also use them to create room freshening sprays. Lemon, Lavender and Tea Tree Oil are my top picks. Scrub Brush: A scrub brush is my best friend while cleaning grout, toothpaste out of sinks and stains out of rugs and carpet. And as I mentioned above, the rags hold a lot of the power. I know a many people swear by Norwex, which only utilizes water and rags, but I haven't been brave enough to try it or splurge on the initial expense. But I can see how it would ring true as I see the difference just in these rags from Target. Microfiber: Soft on surfaces, grabs dust, dirt, hair and most importantly, bacteria. It is lint free and hypoallergenic and can be used to clean just about anything with less effort than normal rags. Glass Polishing Rag: Shines glass and hardware surfaces, works especially well when used in conjunction with a microfiber rag. Wood Polishing Rag: Similar to the microfiber rags, but with a suede-like finish which is extra gentle on delicate wood surfaces. Sponge: When paired with spray or water, the abrasive surface works hard on tough tasks. Magic Eraser: Every mom's hero! Removes scuffs from floors and walls, removes Sharpie marker from surfaces and just about everything in-between. To be sure I don't get lost in all of the fun of cleaning (HA), I try to set a timer. Depending on my goals, I will set a timer and race the clock; sometimes to run through the entire house and other times just for a single task. I tend to lose track of time quite easily, so this is actually one of the most important parts of my cleaning routine. When I am done toting everything around the house, the caddy returns home right under the kitchen sink until my next cleaning session. I keep it turned so the cleaners I use in the kitchen each day are right within reach when I open the door. I have always found joy in a good cleaning session, so putting this together made me oddly happy. I appreciate how quick and simple my tasks are on a daily, weekly and monthly basis, mainly because of how this caddy remains stocked and ready to go. Also, I wanted to point out that I have been slowly moving to all glass spray bottles; I have found a few great ones on Amazon here and here. They work really well and I know they should last me for many more years of cleaning (and labeling). With a good routine throughout the year, spring cleaning for us means that it is now time to deal with those bigger, dirtier jobs. Things like cleaning out the garage, washing our windows, raking the yard and doing general home maintenance are all tasks on our upcoming weekend agenda. But if it means spring is here, then I am all in! 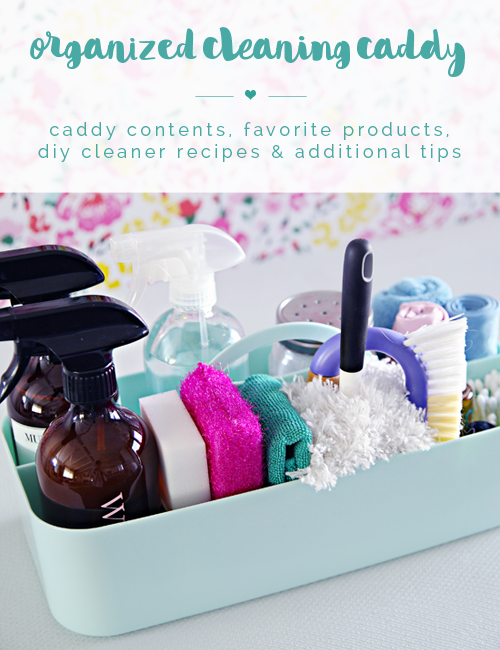 Let's chat cleaning caddies! 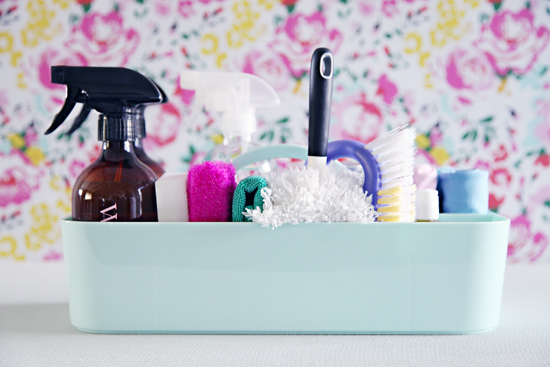 Have you tried one, and if so, what are some of your cleaning caddy favorites? And can we talk about essential oil scents? I think I am officially addicted to adding oils to just about everything... Do you have a favorite smell for your home? And I love essential oils!! My favourites right now are spearmint, wild orange, lavender, white fir, and dōTERRA's Citrus Bliss blend (it's an amazing citrus blend with a touch of vanilla!) 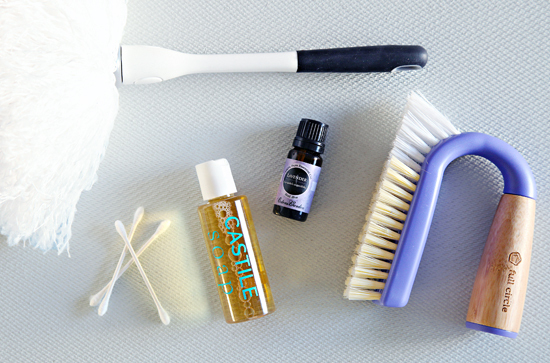 I have really been enjoying researching the benefits and properties of essential oils; it's awesome to be able to incorporate them into my cleaning routine. I love this idea! I always find myself running back and forth for cleaning supplies but having one of these would make life so simple; can't believe I didn't think of this. Thanks for the post....and your cleaning caddy is oddly adorable. 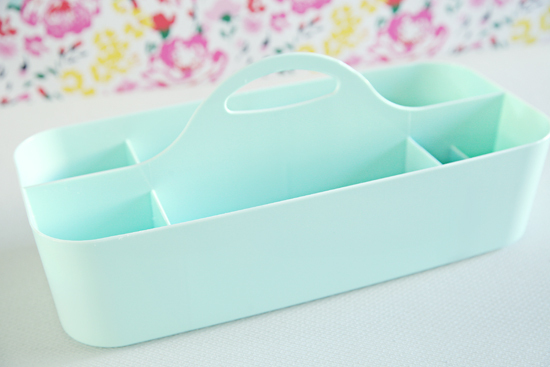 I've been thinking of making a cleaning caddy and this post will be so helpful! Gross question...where do you keep you toilet cleaning brush? I'd like to keep it out of sight but haven't figured out a place to do so without dragging it through the house! 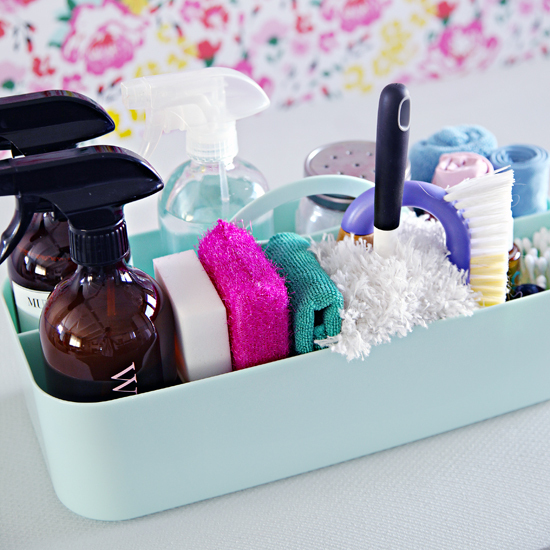 Nice way to organize my cleaning stuff! And the color of the caddy is just what I love! 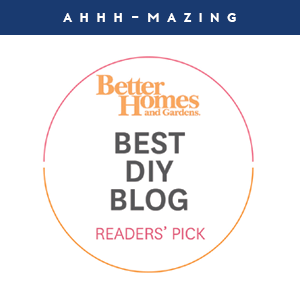 I have to confess- I do not have an organized caddy (yet), my whole house is a mess (we are in a long remodeling process)but I come and check this blog regularly hoping to get organized some day...Jenny, you are my favorite blogger! Now, do you have any tips on cleaning stainless appliances? We inherited an older stainless refrigerator and I swear, it shows every single finger print, water drips, etc. Cant figure out how to keep it clean. Thanks. We have experienced stainless with smudge proof finish and stainless without and what a difference! Unfortunately, the fridge we have now doesn't have it. So, I have been trying everything to find the right magical cleaner, and I was hoping to do a review/post of all of my trials and experiences. I will say that so far what I find works best is a stainless steel polish spray, but I don't like how it settles on the floor in front of the fridge so I am not sure I am sticking with it. I will be sure to keep you guys posted, I have a few more products to test out. :) xoxo! Have you tried the stainless steel wipes? They are basically the polish in Clorox wipe type container. No spray means no mess on the floor. I can tell a huge difference in how quickly smudges and fingerprints show up when I don't use them. I have tried the Weiman Stainless Steel Wipes and was super frustrated with how streaky they were (they left whitish streaks?). I wonder if it had something to do with what I had used to clean the fridge prior? Because they weren't good... I might have to try them one more time because I always hear good things. When you use the Weiman Wipes just use a clean dry cleaning cloth after you apply the wipes to the surface. No streaks! I think it's like you said Jen-it's all in the rag. The store I bought my stainless fridge from gave me a rag-just get it slightly damp with water and wipe. No streaks or marks left-just shine. With 3 messy kids I have yet to encounter something that can't get easily wiped off with it! This is so helpful! 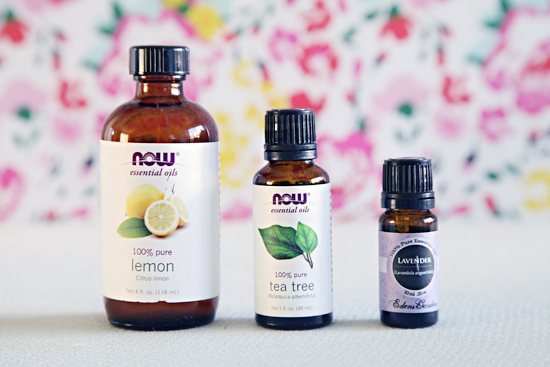 Can you give more details on what you like to use each essential oil for? I have lavender and tea tree, but never know what to use the tea tree one for. Also, do you find that your wood cleaner stays mixed, even though it combines water and oil? Thanks! I like to use the lemon in my glass and wood cleaner because of the smell... And the lavender is usually used in room sprays and when freshening linens. I use a canvas covered bin I found at Target a few years ago. Works great! As for essential oils, my favorites are orange, lemon, and tea tree. I also wanted to add for anyone who had granite countertops, I recently found a GREAT recipe for granite cleaner: 2 cups water, 1/4 cup rubbing alcohol, 1-2 squirts of dish soap, a few drops of your favorite essential oil. I wipe down my counters with a wet rag to get off all the crumbs and stuff, spray this on, let it sit for about 5 minutes, then wipe it off. And my counters are SHINY. 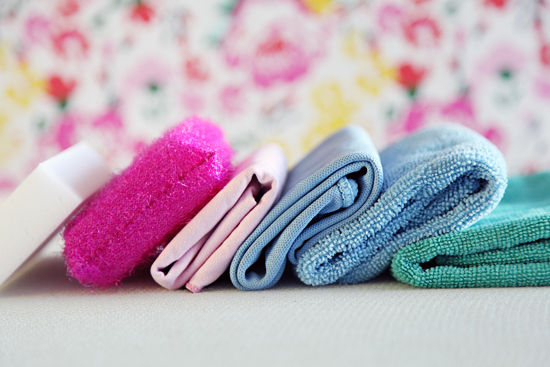 I'm wondering how you deal with your rags and sponges after a cleaning session? Do they get tossed In the wash and replaced in the caddy by clean copies after each cleaning session or rinsed out and hung to dry and then put back or? Thanks for all you do! It is so inspirational! I just packed my cleaning supplies for our shore house. Thanks for the links to the bottles, some of my larger ones are unwieldy! Do you wash your rags or re-use? I read a million different things on it. I love this post! That caddy is super cute, and I love the color. I really should make a cleaning caddy because I do grab each cleaning supply one at a time and this is much more efficient! 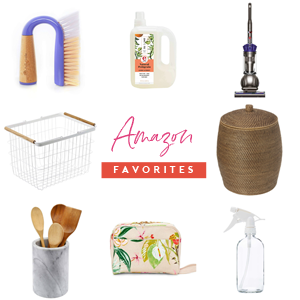 I love that you've included simple green cleaning recipes in here. Have you tried adding some rubbing alcohol to the glass cleaner? It's my secret to having the glass be streak free because it evaporates more quickly. You might be able to skip the polishing rag that way! 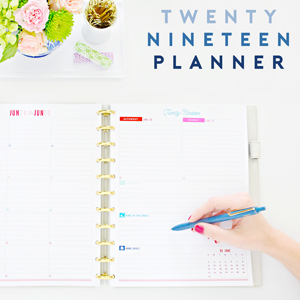 Could you give examples of how much time you give yourself to complete certain tasks? I also have the problem where I get lost in the cleaning and lose track of time. Before I know it I've only got half of what I wanted to do done and have to run out the door to the next thing. I love this idea! I'm checking into that caddy now. Also what app are you using for your timer? It looks great! I use an app called MultiTimer, which allows me to manage pre-set timers for different tasks. 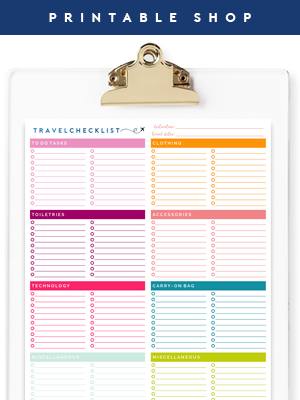 I just recently started using it, but I like that it helps me better manage things throughout my day. 1. How/how often do you clean your cleaning cloths? I worry that they will lose their texture/effectiveness when I wash them but it's gross to never wash them too. 2. Also kind of gross, but what kind of cloth do you use to clean your toilet and toilet seat? Thanks, Jen! 2. I keep a stack of clean microfiber rags in each bathroom. I start with the mirror and fixtures, then clean the sink, then the top of the toilet and work my way down the toilet to around the floor. I toss those rags into their own wet bag or bin, and wash those rags separately each week in a sanitary load. I use a brush on the inside of the toilet, which stays stored under each bathroom sink. Thanks so much for your reply, Jen! Have a great weekend and Easter holiday! Thankyou for sharing the glass bottle links--what a great idea! I'm new to essential oils and am working on replacing our traditional cleaning products with more natural homemade products. 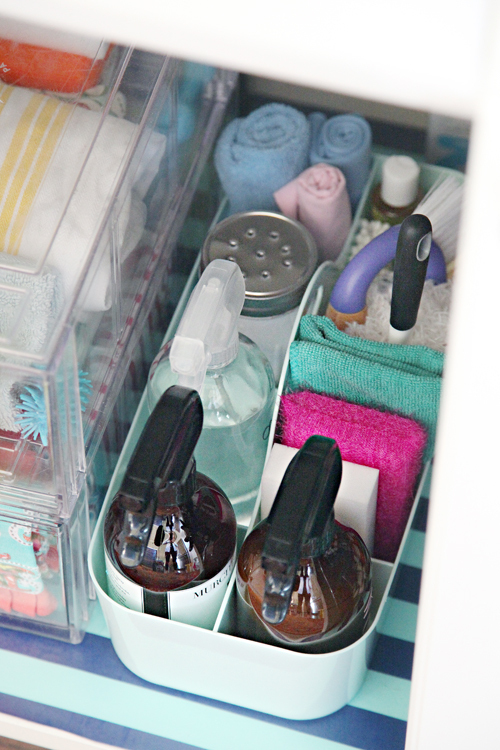 Thank you for this post, both for the organizational inspiration and the cleaning recipes/tips! What do you use to clean your toilets? I'm having a hard time letting go of my Clorox gel!! I love the timer idea and will begin using more of the essential oils now that the temps are warming and the windows can be opened. Have you heard of Norwex Cloths? I LOVE them and no I don't sell them. LOL My friends started having Norwex parties and I was so blown away by the demonstrations. You can clean butter off the glass window with nothing more than their microfiber cloths and water. The cloths contain silver in them which is disinfecting while you clean. So in theory you do not need any cleaner. I, however, don't feel like my things are clean without a homemade cleaner sprayed on (except windows I use just the glass Norwex cloth). I want to check out the multipurpose spray you recommended. I love that glass bottle! I also love using essential oils. I have a diffuser in every room and we couldn't do without our oils during cold/flu season! Could you provide a link to your glass polishing cloth. I would love to try one! I'll add my vote to the Norwex cloths. I never go for things like that, but I attended a party at my friend's house last year and bought the sales pitch--and the cloths. They get my glass and mirrors cleaner than anything I've used before--and just with water! Hi Jen, love your caddy and recipes.. I was just wondering what you use to clean your showers/baths? Thanks for your post. I like that the recipes are simple and use everyday products. I am going to have a go at making the glass cleaner and utilising the baking soda one for my sink. Norwex is truly amazing, you should at least attend a party to see the demo or watch some videos on youtube. They have changed my entire cleaning routine and I don't use any cleaners now except specialty ones. Where did you get those nice spray bottles? I'm always on the hunt for nice ones. Hey Jen, You should try Norwex! It is awesome! I love it so much I signed up to be a consultant when they had a $10 sign on special earlier this year. I am not a sales person by nature, so I signed up solely for the personal discount :) If you have any questions I'd be more than happy to answer them! I love your posts! I have been using a caddy since your last post and it's been working great. I use the Casabella Cleaning Caddy that fits on top on their bucket. 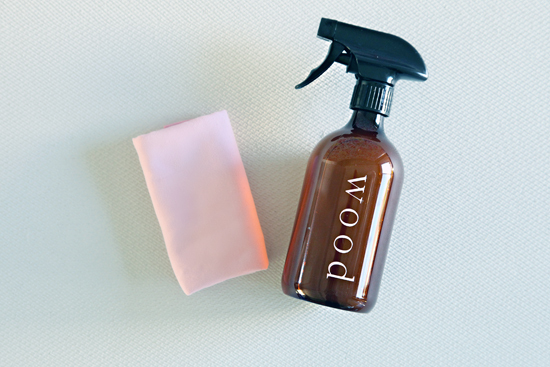 I use the orange :) (I like it better than the graphite) I have been working my way to DIY cleaners using your recipes but have found that I still use an all purpose cleaner (Method). Will try the one you recommended now once it's done. Thanks again for all your tips. I'm trying to teach my 9-year old to be proactive and take more responsibility around the house (i.e., keeping her room clean, cleaning her bathroom weekly, doing her own laundry). This is such an awesome project to empower her for all of that! We're going to head to Target so she can pick out her own scents, rags, and caddy. Thank you so much! I think you. Any have read my mind. As I was working on Sprin Cleaning today (5 bags of trash and 3 totes of items to donate woohoo!) I realized the counter spray I keep in my bathroom had a broken trigger. And I wanted a new bottle for my shower cleaner, but I didn't know what to get. I though to myself, "I bet I could leave a comment and ask Jen where she gets hers! I hadn't read any of my favorite blogs in about 10 days, so after today's hard work I decided to lay in bed and catch up on blogs. I saw the cleaning caddy title, and I was like, "yay! Perfect post to ask Jen where to go for good spray bottles." Then I read, and not only had you already answered my question, you even provided links. You knew what I needed before I even did! So thank you for your awesome mind reading abilities. Just the other day I was wondering what you've been up to cleaning wise-thanks for sharing an update! My eight year old daughter is delighted cleaning wood whilemy husband and I take care of the rest! 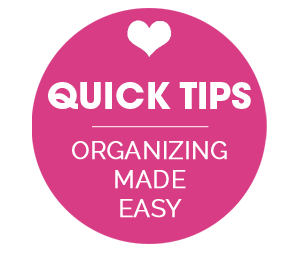 Many thanks for being so generous sharing your organizational skills and great ideas.